Tis the season of giving! As we quickly approach the holiday season, Valley Elementary School students are learning about the precious gift of giving in a big way. Valley Elementary’s student body was asked to perform a community service project this fall. This project stressed the importance of giving back to the community to their students. Valley Elementary Kindergartener, Bradley, along with his mother, Alison, tried to think of something they could do to have a positive impact on families in their community. They turned to Comfort Care Hospice of Pelham’s Volunteer Manager, Libby Jones, for advice. “Bradley’s mom is a nurse at Comfort Care Hospice of Pelham. She asked me if I knew something he might do to help a hospice patient or their family. We pondered several ideas. Alison and Bradley talked about options and he decided to complete not just one project, but two projects! I am Bradley, a student of Valley Elementary School. I am collecting food for needy hospice patients in our neighborhood. Look how empty the cabinets are in the hospice office! Can you share some food from your pantry? Here are some ideas: all types of canned goods, rice, dried beans, cereals, powdered milk, microwaveable meals or anything that doesn’t need to be refrigerated. I will be back on 10/24/15 to pick up your items. On Saturday, October 24, Bradley retraced his steps and revisited the houses he had before. As Bradley went from door to door, he was not sure what to expect. 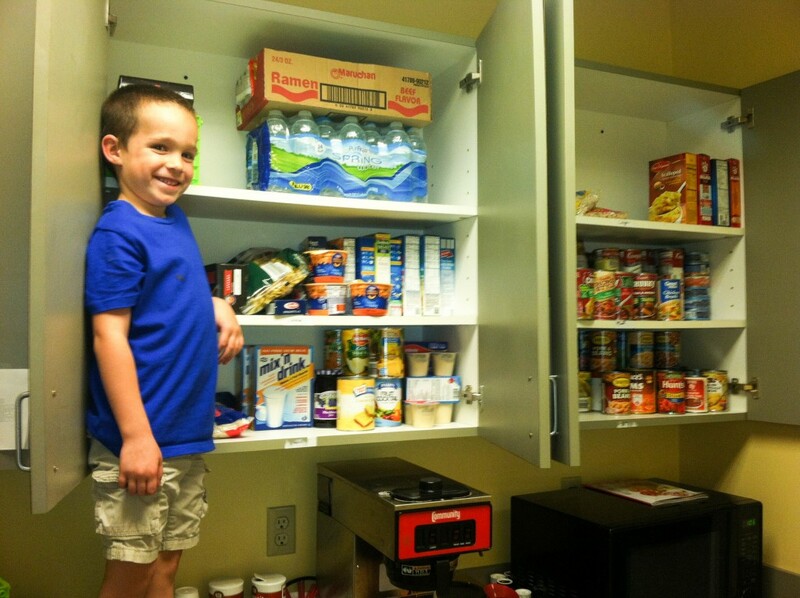 After three hours, he gathered enough items to fill the cabinets of the hospice pantry. What a response! His neighbors thanked him for the opportunity to help. Some left messages for him. The response of his community’s giving heart made Bradley feel proud to be a part of something bigger than himself. “They were nice to share. It was fun to help and now the cabinets look good,” Bradley said.